Wobbler fishing could be seen as simple and no doubt it is simplistic in nature - that's a large part of the appeal. With that in mind it is the subtleties of the technique that equal payoff. "Hog-lines" form and boats drop anchor, rods are rigged up and lines are dropped; coffee is poured and stories start. Hopefully, if all goes well the rods will fold and nets will fly. You can go out in the Columbia river with a rudimentary knowledge of Wobbler fishing and have success, especially if you follow some key guidelines. With the barbless regulations in effect, landing a fish will be your next challenge. With these tips we hope to increase your odds of success. Fall Chinook typically run in much deeper water than their Spring counterparts. This is likely due to water temperature and conditions rather than biological nature. Use 30 - 50 feet as a general rule for finding your slot. That is a solid place to start but do not be stubborn and assume just because one depth was working on a certain day or in a certain place that it will produce again. 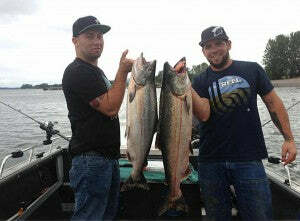 The benefit of the wildly popular Fall Chinook fishery is that there is plenty of visual reference as to where to fish. With hundreds of boats fishing in "Hog-lines" it becomes quickly apparent what slots are producing. It may not be wise to try to immediately copy what you see, but keeping a reference of their location or finding the same depth below or above that slot may be the right idea. In some cases you'll see that as lighting changes the bite will move - those that are consistently out on the water will have the advantage of being able to compare times of day, tide adjustments and lighting conditions to catch ratio. Trial & error and observing will go a long way. This fall, it's worth it to change it up a bit until you're getting good results, don't settle for sub-par results as there is big numbers of fish available! Proper rod selection will help increase your odds of success. Yes, you can get away with fishing many rods but having one designed for Wobbler fishing allows maximum efficiency. 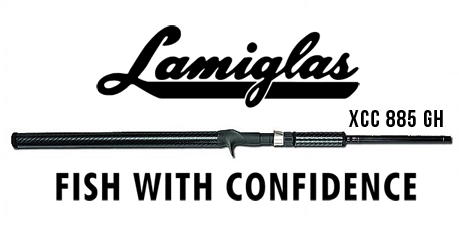 Lamiglas has designed a rod specifically built for the Columbia River Wobbler fishery. The XCC 885 GH Certified Pro Kwik series is a 15-40 lb (line rating) rod available at Sportsman's Warehouse and many other fishing departments. At 8'8" it is the ideal length for heavy-lead applications with a moderate-fast action built to make your lure have the perfect wobble. I would typically stay with a stouter rod as these fish are big - having a bit of length to the rod is ideal for keeping lures separated. There is a lot of discussion on best practices for Wobbler fishing. You're going to find that every circumstance has its standout subtleties but you can usually achieve success by following a few simple guidelines. Use a 5 - 6 foot lead dropper - You will be rigging up a spreader first and then choosing line-length to your required weight. This is a very essential step. In deep slots (40 - 50 foot range) go with 5 - 6 feet of line to your lead. You can shorten that in shallower water but 5 - 6 feet seems most consistent. There are a few exceptions of course but for any standard situation stick in that range. For dropper leader you should consider using a lighter lb test, so if you happen to get in some rocks or on some sort of snag you wont lose your favorite Simon Wobbler! Use a 5 - 6 foot leader - LB test will depend on what you choose to put your faith in - leader length should typically be around 5 - 6 feet long. Same leader and lead line length is standard (5 x 5 is typical) You should be using at least 30 lb test leader with some guys using up to 50 lb test. Wobbler Selection - This is where you'll hear some of the most heated debates and opinions. Some years people will swear by a certain color combo or a distinguishing feature (one year we kept hearing about the "purple-dot.") The fact is, many colors and finishes will work at any given time but you're going to find that some stand out. This is where having multiple rods out with multiple colors will do a lot of good - pay close attention and adjust. Don't be afraid to ask about what's working around you. Below are some of Fishing Addicts personal favorites : these have produced well for us and are great standby wobblers to start with. Hugely important to successful wobbler fishing is to tune them! Wobblers are most enticing to salmon when they run at the right speed. Bending the wobbler at the crease will affect the action of the wobbler. The more bend in the crease =faster action, the flatter or less bend in the crease = slower action. A slow even wobble is our preferred action but as you might expect, there are certain times when more action pays off. The important thing is to keep experimenting with your tuning, then drop your wobbler down at the side of the boat and watch it. If it looks fishy, fish it. If it looks bad, re-tune it until it looks fishy. Then see if the fish agree. 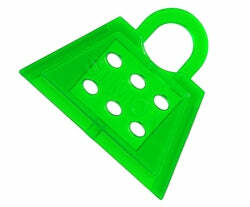 One particularly innovative product that has just hit the scene is the Simon Backpack. It's basically a "cheat-code" to a well-tuned wobbler. These little hunks of goodness stabilize and slow the action of Simon wobblers and cause them to swim perfectly without ANY tuning - even in fast current. You can also add scent in the scent chamber built into the Backpack. "TUNING!" We cannot overstate this enough. Pay close attention to the action of your wobbler and it will pay off in takedowns. Scent suggestions can be ambiguous as it's a factor that is hard to measure. Our typical scent application for Wobbler's is to wash them consistently with Lemon-Joy soap. This could account for scent or simply for a clean lure. Either way it's worth it to experiment and find out what works. Some good scents to start out with would be sardine, herring, garlic, or tuna. It's well known that salmon key in on scent hugely, we just notice it more when fishing bait in small rivers rather than fishing hardware in the big river. One particular example being a day where we had 5 rods out of one boat - four wobblers had scent, one wobbler had no scent. That wobbler got clobbered all day and the others never got touched - this is not to say it was the scents fault - plenty other factors could have been at play, but it was interesting to note. All in all - go with what you have confidence in. Anchor fishing is an odds game - just like any other fishing. You are going to notice things about your program that consistently produce fish. This could be a slot, a color or leader length - whatever it is watch it and compare it. Use other boats and other fishermen as a reference point. Make the little adjustments, watch the tides, watch the lighting. Don't write off a wobbler just because you weren't fishing it correctly, also have the confidence to switch things up and try a new color. There will be a great number of Fall Chinook coming up the Columbia this year - this allows you the luxury of fine-tuning your wobbler game and achieving maximum success. If your looking to get out this fall and wanna learn all the tricks please book a trip with our featured guide - Columbia-River-Guided-Fishing! Fishing Addicts Northwest will no doubt be out on the Lower Columbia this year putting in work on the biggest run of Fall Chinook we've yet to see. Watch for video content and more articles to come on this fantastic fishery. Great info. Look forward to wobble fishing this fall for the first time.